"As for your daughter, she will be oppressed and deprived, and the rights which you gave her will be usurped. She will be beaten while she is pregnant, her sanctity will be breached, and her house will be entered without permission. Then she will be humiliated and disrespected. She will find no protector, she will suffer from a miscarriage because she will be beaten, and she will die as a result of that beating." When the Prophet (saww) was taken to the heavens on his journey (at night), he was told, "Verily Allah, the Blessed and the Exalted, will test you with three afflictions to see how patient you will be." The Prophet (saww) replied, "I submit to Your command, O Lord. And I have no power to stay patient except through You. What are the three tests?" He was told, "The first (test) is hunger and giving preference to the needy over yourself and your family." The Prophet (saww); replied, "I have accepted, O Lord. I am pleased (with Your Will) and I submit to it, and I seek success and patience with You." The second (test) is that you will be belied and you will be in extreme fear (for your life). You should spend your wealth, your blood, and your soul fighting against the people of disbelief, you should remain patient when you will be harassed by the disbelievers and the hypocrites, and you should remain patient when you will be hurt and wounded in battles. The Prophet (saww) replied, "I have accepted, O Lord. I am pleased (with Your Will) and I submit to it, and I seek success and patience with You." He was told, "The third test is that your family will be killed after you. As for your brother, 'Ali, your nation will slander and rebuke him, they will be violent with him, they will deprive him and usurp his rights, they will oppress him, and finally they will kill him." The Prophet (saww) replied, "I have accepted, O Lord. And I am pleased (with Your Will), and I seek success and patience with You." He was told: As for your daughter, she will be oppressed and deprived, and the rights which you gave her will be usurped. She will be beaten while she is pregnant, her sanctity will be breached, and her house will be entered without permission. Then she will be humiliated and disrespected. She will find no protector, she will suffer from a miscarriage because she will be beaten, and she will die as a result of that beating. The Prophet (saww) replied, "Surely we are Allah's and to Him we shall surely return' (2:156). I have accepted, O Lord and I submit to it (Your Will), and I seek success and patience with You." He was told, "She will have two sons from your brother. One of whom your nation will loot, stab, and kill unfaithfully." The Prophet (saww) replied, "Surely we are Allah's and to Him we shall surely return' (2:156). I have accepted, O Lord and I submit to it (Your Will), and I seek success with You for being patient." As for her second son, your nation will invite him for Jihad but then they will kill him while he will be helpless. They will also kill his children and his family members who will be with him and they will loot his women. He will ask for help from Me but I have already willed his martyrdom and the martyrdom of those with him. His killing will be a decisive argument against everyone in the creation. The inhabitants of the heavens and the earths will weep and lose patience over him. And the angels, who will not be able to help him, will cry over him. However, I shall raise a man from his progeny whose shadow is with me under the Throne and through whom I shall support him (Husain). He will fill the earth with justice and equity. The fear from him will travel with him and he will kill so many that people will doubt him. The Prophet (saww) replied, "Surely we are Allah's." Then he was told, "Raise your head." I looked up and saw a man who looked and smelled better than all people. He had a blessed visage and he was wearing clothes made of light. Light was emanating from his forehead, from over him, and from under him. He was surrounded by several angels who could not be counted except by Allah, the Great and Almighty. Then I asked him to approach Me. He (as) came close to me and kissed my forehead. I said: O Lord! Who will this man avenge and for whom will he show his anger and for what reason have you prepared these angels?! You informed me about that which will be afflicted upon my family. You can support them against their oppressors if You will. You have promised victory for me and my family and I await the fulfillment of Your promise. Verily I have accepted and am pleased with Your Will and I submit to it, and I seek success and help from You to be pleased and patient. As for your brother, he will enter the "garden of abode as residence" (32:19) for staying patient. On the Day of Resurrection, I shall establish him as an argument on the creation and I shall authorize him to stand by your Pool (the Pool of Kawthar) where he will distribute water to your friends and prevent your enemies from drinking from it. I will make Hell cool and safe for him so that he can enter it and bring out anyone who has even an atom of love for you. I will make all of you [the Ahlul Bayt (as)] dwell at the same level in Paradise. As for your son, who will be abandoned and killed, and your other son, who will be betrayed and killed while he will be helpless, I will decorate My Throne with them for having suffered from the afflictions which befell them (in their lives), and they will be honoured in ways which are unimaginable by anyone from among mankind. Therefore, rely on Me. I shall honour those who go to his (Husain's) grave because those who go to his Ziyarah have come to your Ziyarah, and those who come to your Ziyarah have come to My Ziyarah and I will surely honor those who come to My Ziyarat. I will fulfill all of their requests and reward them in such a way that everyone will envy them when they see how I dignify them and the honor which I have prepared for them. As for your daughter, I will make her stand next to My Throne and she shall be told, "Verily Allah has appointed you as the ruler over His creation. Therefore, rule however you want regarding those who oppressed you and your children, for your ruling will be executed." So she will come to the courtyard (where the judgment will take place) and she will order those who oppressed her to be taken to Hell. Then the oppressor shall say, "Alas, woe to me for what I neglected toward Allah"(39:56) and he will wish to return to life. "The oppressor shall bite his hands saying: 'Would that I had taken the Path with the Messenger. Woe to me! Would that I had not taken so-and-so as my friend" (25:27- 28). And "until when he comes to Us he will say: 'Would that there was a distance of two easts between you and me, you are an evil companion.' It will not profit [them] on this day because [they] have oppressed, and [they] will be partners in chastisement" (43:38-39). The oppressor shall say, "You alone shall judge between Your servants concerning that wherein they have differed' (39:46) or is the judge someone else?" They will be told, "The curse of Allah be on the oppressors who hinder (people) from the path of Allah and seek to make it crooked, and disbelieve in the Hereafter" (7:44-45). 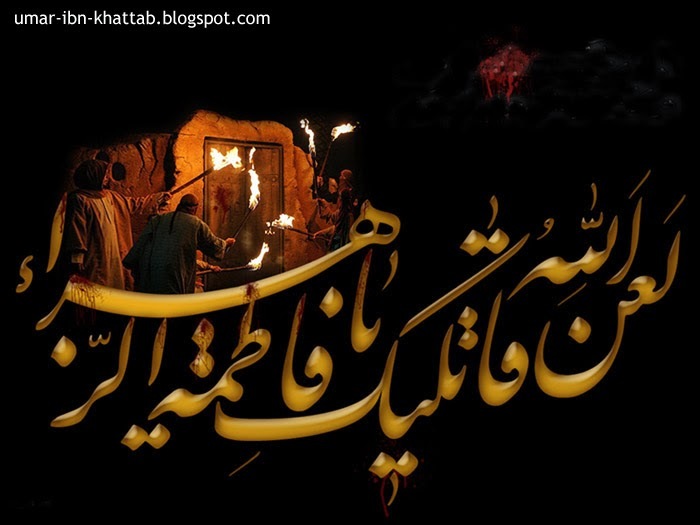 The first judgment will be between Muhsin ibn 'Ali (as) and his killer - referring to the second usurper. Then he will be brought forth along with Qunfudh and they will be lashed with whips of fire. The whips will be such that if one of them hits the oceans, all of the oceans will boil from the east to the west and if (even one whip) touches the mountains, they will all melt and turn to ash. Then the Commander of the Believers (as) will kneel in front of Allah so that Allah judges between him and the fourth (usurper) - referring to Mu'awiyah. Thereafter, they (the second usurper, Qunfudh, and Mu'awiyah) will be thrown in a well (of fire) which will be covered so no one can see them and they will not be able to see anyone. So those who followed them (in this life) will say, "O Our Lord, show us those two among the Jinn and men who had led us astray. We will trample them under our feet so that they may become of those who are the lowest" (41:29). The Two will come to the Pool, (imprisoned) by the Keepers (of Hell) and will say to the Commander of the Believers (as), "Forgive us, give us some water, and save us." "But when they shall see it near, grieved shall be the faces of those who disbelieve, and it shall be said (to them): this is what you have been calling for" (67:27) by referring to yourselves as the commanders of the believers. Return to Hell thirsty. You shall receive no drink but Hamim and Ghislin and "the intercession of the intercessors shall not avail you (74:48).